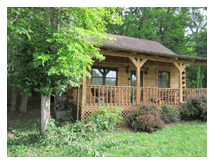 Click Here if you want to check which loghomes are available for the dates you desire. The Black Bear 2400 sq. feet. A very spacious house with lots of light provided by the floor to ceiling windows. The gently sloping ramp from the parking lot to the front porch and a master bedroom on the main floor makes this an ideal house if there are persons with limited mobilty in your group. Main floor; A full spacious kitchen open to the living room and dining room, a master bed- and bathroom and a spacious deck and porch. Upper level; A loft and two bedrooms with two twin beds each. These share a full bathroom. Lower level; A family room with 42" TV, a full bathroom and another bedroom with a queen bed. Outside you will find a park style grill and a picnic table. The West Virginian 1900 sq.feet. 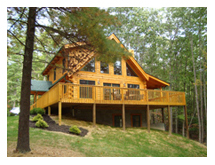 A three story traditional log home with wrap around porches and a large kitchen. Ideal for those who want to be together but at times also value their privacy. Main floor; A dining area seating eight, a large kitchen and a seating area with very comfortable furniture, a half bath and a wrap around porch. Upper level; A large master bedroom, a smaller bedroom with two twin beds and a large full bathroom with clawfoot tub. Lower level; A spacious family room, a large bedroom with a queen bed, a smaller bedroom with a bunk bed and a full bathroom. Outside on this level, you will find a picnic table and a park style grill and a fire pit. A cozy comfortable loghome, ideal for families with children. It offers eight beds in four bedrooms so you won't have to deal with pull out sofas.Access by a boardwalk makes you feel like being on a small island in a sea of green. Main floor; A dining room seating six, the living room and a spacious kitchen, a counter where two or three children can eat, a half bath and a spacious deck at the back and a porch at the front of the cabin. Upper level; The master bedroom with seperate bath, two bedroloms with two twins each which share a full bathroom. Showers only. Lower level; A bedroom with two twin beds built into the walls. Outside a picnic table and a park style grill. The perfect cabin for small families or two couples seeking a quiet time together. It is easy accessable straight from route 20, but sits back far enough to offer peace and tranquility. Main floor; The living room with a wood burning fireplace, dining area and a compact but complete kitchen. A spacious bedroom with a queen bed and a full bathroom. In front a covered porch and private courtyard with hot tub in the back. Upper level; A spacious bedroom with a queen bed and a large full bathroom. 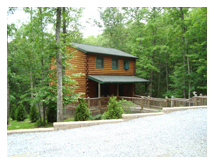 A cabin specially designed keeping honeymooners and small families in mind. 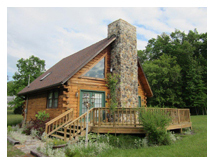 Easy accessable and very close to Pipestem State Park. Main floor; The living room with a wood burning fireplace, dining area and a compact but complete kitchen. Open to the living room is the master bedroom with a kingsize bed and.....a jucuzzi hot tub and a full bathroom. A spacious deck in front and in the back a private courtyard. Upper level; A private loft with two twin beds accessable by a spiral staircase. C 2012. Site Designed and Hosted by Solitary Solutions, Inc.